The Parent Association is comprised of members of the parent community and seeks to inspire, inform, and organize the parent body. The Parent Association nurtures a healthy social network at the school through fostering warmth and communication between all members of the community. 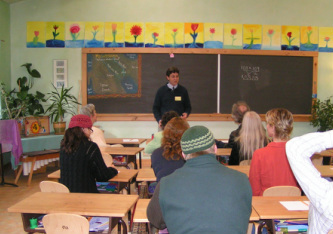 The Parent Association is composed of two members from each class who serve staggered two-year terms. There are additional liaisons from faculty and staff. One Parent Association member will also serve as a member of the Board of Trustees. If you are an OWS parent who would like to get involved in the Parent Association, please contact the PA Chair, Laura Viik.